I promise that I’m not a lush. I realize that this is my 2nd review of an alcoholic drink in a week, but please understand that I haven’t been trying 50 different types of alcohol during the week. One weekend, I took a couple of the samples I was sent to a friend’s house – the aforementioned friends with more refined “alcohol-palettes” – and we all sat down and tried these two drinks. So I’m not taking swigs from bottles during the week to write these reviews. For this review, I had to do a little bit of research (meaning Googling) to brush up on my tequila knowledge. Tequila is an alcohol made primarily around the Tequila region of Mexico, due to the area’s ability to grow blue agave, from which tequila is made. The agave plant is manually planted, cared for and allowed to grow until harvest time. The amount of time waited before harvesting impacts the amount of sugars in las piñas. After harvesting the piñas are cooked or pressed, then allowed to ferment or age before distillation or bottling. 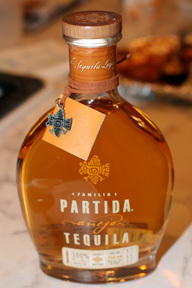 Partida Tequila is made from 100% pure blue agave that is grown on the Partida Estate. Their agave plants are allowed to grow from seven to ten years to allow the sugars to “mature” and to create a fuller flavor. After harvesting, las piñas are slow-cooked in steel ovens to soften the fibers and turn the carbs into sugar. They use two distillation processes to purify and to perfect their tequila. The end result is a tequila that is strong, but very smooth going down and not overwhelming. You could take it as a shot, but we tried it by taking sips first. It’s still very strong, but isn’t as harsh and didn’t burn as much as some other premium liquors tend to do. It’s more like a subtle warmth that extends down your throat deep into your belly. Strength of the alcohol aside, the flavor is crisp and clean. I ended up adding some hot apple cider to mine per one of their suggested drink mixes. This turned the tequila into a girl-friendly drink and made the potent flavor a little less strong. If you don’t have cider on hand, you can also use Partida Tequila to make margaritas. I myself really enjoy a nice drink sometimes and this drink sounds like something that I would like. I must say, that you reviews are very informative and also have a uncanny way of being unbiased. Thanks for sharing. This is an amazing drink. The best metaphor I can think of at the moment would be.. “It's like drinking Fire, without the heat.” For those of you who like smooth, but potent drinks…this fits the mold.Thanks for the recommendation! This is an amazing drink. The best metaphor I can think of at the moment would be.. “It's like drinking Fire, without the heat.” For those of you who like smooth, but potent drinks…this fits the mold.